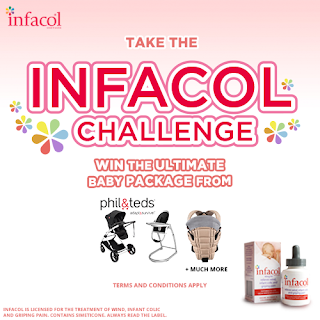 I mentioned in my previous post that I will be sharing some fabulous competitions with you all, and so the second competition I'd love to share with you is also from a baby health care specialist but this time it's Infacol! The Infacol Challenge is a little different from the other game I mentioned in my last post, and is a tiny bit more difficult, but it's still great fun and who doesn't love a challenge or two!? To win instant prizes such as Phil & Teds Ultimate Baby Bundle, worth over £700 and £100s worth of Venture Studio vouchers, all you have to do is take part in two small, quick and easy colic related game challenges! The first challenge is the tricky dropper challenge! All you have to do is drop the dropper onto the target! Hit nine (9) targets before the time runs out and then you go onto the second challenge! The second challenge is a frantic bubble busting game, all you have to do is tab 40 bubbles in the virtual baby's tummy before the time is up! You will only be able to enter the prize draw if you complete both challenges in the 80 seconds provided! 1. Search or find Infacol on Facebook: www.facebook.com/Infacol and like the page. 2. Click on the Infacol Challenge app. 3. Take on the two Infacol Challenges! 4. If you beat the clock and complete both games in under 80 seconds, you'll then be entered into an instant prize draw! I personally need to practise a few more times as I can't pop the bubbles quick enough, so I've not been able to enter the prize draw just yet, but on my last try I was only one bubble point away!